During the fur trading era, a dog sled was one of the most important forms of transportation used by the Hudson's Bay Company and the North West Company. In the warehouse/barn building at the Last Mountain House Provincial Park in Saskatchewan, Canada, visitors can view the map and the dog sled routes which were used in 1869. The main role for the dog sled teams was to carry furs, meat and goods and to deliver messages to the forts during the cold winter months. The dogs would easily make their way over most of the snow covered landscape and eventually some of the routes became familiar to them, but even they could not make it when weather conditions became treacherous. Rupert's Land was dominated by the Hudson's Bay Company in the 18th and 19th centuries and they were the first to establish the fur trade posts around James Bay and Hudson Bay. The map at the Last Mountain House Provincial Park in Saskatchewan lets visitors see for themselves the routes which were followed. 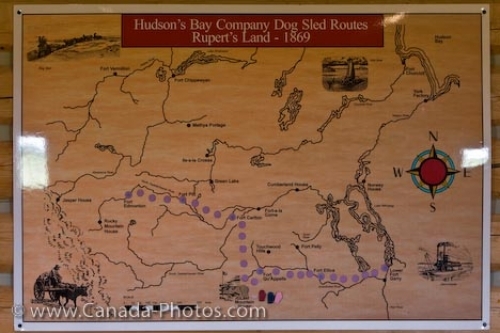 Picture of the routes the dog sled teams used in the fur trading years by the Hudson's Bay Company in Saskatchewan, Canada. Map inside the warehouse/barn building at the Last Mountain House Provincial Park, Saskatchewan, Canada.